Giveaways are a sure-proof way to boost your marketing campaign and promote your business. They are designed to grab potential customers’ attention, generate new leads, enhance visitors’ engagement, and boost your brand’s visibility. What’s more – giveaways are an exciting way to promote your business whilst giving your followers something in return; a prize that will show them you truly appreciate their support. 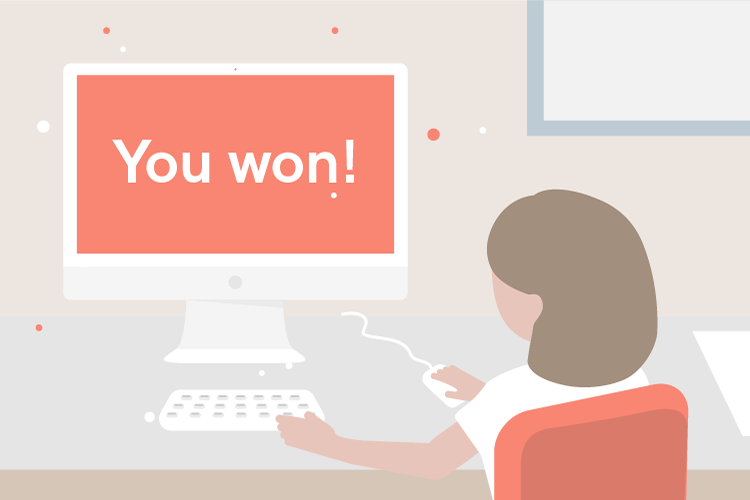 The ending of your giveaway should not mark the ending of your marketing campaign. You need to keep your visitors enticed and interested in your business, and creating a well-designed and well-thought-out giveaway congratulations message is an excellent way to achieve this. We have prepared a detailed guide on how to create the perfect giveaway congratulations message, so continue reading to ensure you take full advantage of your giveaway and get the best possible results for your business. Share the excitement – Start by congratulating them on the win and make them feel good about it. The best way to achieve this is by starting your email enthusiastically, in an upbeat tone that will grab the winner’s attention from the very beginning. Share the information – Equally important is to let your winners know how they won and why. In other words: if it’s a contest, explain that they were chosen based on the quality of the material they submitted, their unique set of skills, or their performance; in case of a sweepstakes, tell them they are chosen at random. Also, don’t forget to include a direct link to your giveaway so they can see what you’re talking about. Verify the eligibility criteria – If you’re organizing a contest, certainly there are some criteria that should be met in order for a winner to claim the prize. Thus, first check whether the winner is actually eligible to win according to the entry requirements listed in your terms and conditions (e.g. age, location). Ask for the shipping information – Inform the winner that you’ll be sending the prize by mail and ask for any information you need related to their place of residence, such as their city, postal code, and address. Ask for a permission – Let them know that you’d like to share the post-giveaway announcement on your social media profiles like Facebook, Twitter, or Instagram, and be sure to check whether you can use their name and/or image. Personal touch – Ask the winner to send you an image of themselves taken right after they found out they won your giveaway. It’s a great story to share with the rest of your followers, plus they’ll see that an actual person won and will be reassured of your giveaway’s legitimacy. 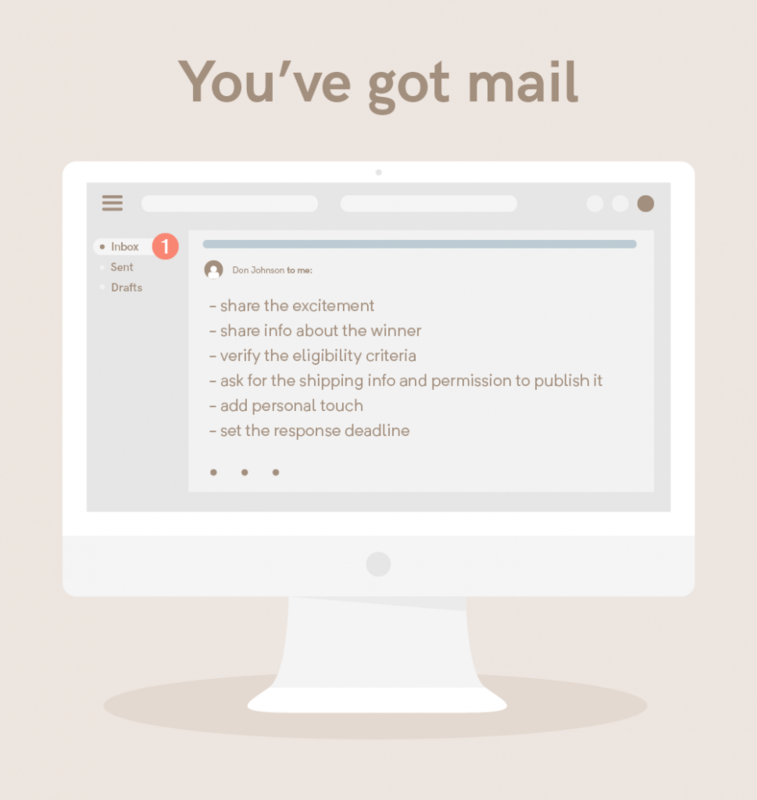 Give a time frame for a response – Give the winner a time limit (usually from 48 to 72 hours) to respond to your email in order to claim their prize. In case they don’t respond, you can contact the next winner in line. Sign off – When signing off, make sure to add as many details about you and your business as possible, including your blog/company/website name, location, and contact information. By doing so, you come across as someone who is genuine and trustworthy, while promoting your business at the same time. Once you’ve heard back from the winner, it’s time to announce the big news on your website so the others can see the giveaway results as well. You’ll want to include certain details about the winner, such as their name, the reason they’ve been chosen, and the prize they won, as well as any additional details you deem important. It’s also a good practice to include their photograph, but you have to get the winner’s approval first. The best way to make such an announcement is to create a congratulations message. Not only does it serve as proof that the giveaway was legitimate, but it also represents an excellent tool to promote your business and enhance your marketing campaign. Creating a custom template for page promotion – If you happen to have a section on your website that is exclusively dedicated to giveaways, it would be best to use your expired entry forms to promote the giveaways that are currently live and running. Such promotion will attract the group of your followers who are interested in participating in contests/giveaways/sweepstakes – and what better way to do so than creating a custom template? It allows you to have all the information related to your current giveaways posted on the expired entry forms almost instantly, making it easier to keep your followers updated. Offering exclusive deals and discounts – Having special offers and discounts is a great way to attract the attention of your entrants, and make your services or products more appealing to them. What’s more, special offers can serve as a consolation prize for those entrants who weren’t lucky enough to win. Your congratulations message should include a special discount, or a prize to be won at random. This way, even when the giveaway is over you’ll keep your clients engaged. Keeping your visitors informed – Once the giveaway is over, you’ll want your visitors to keep up with you and your business. A surefire way to spark your visitors’ interest and keep them informed is to include other content you have into the expired entry form. Make the information easily accessible by including links to your blog, social media profiles, or your newsletter. 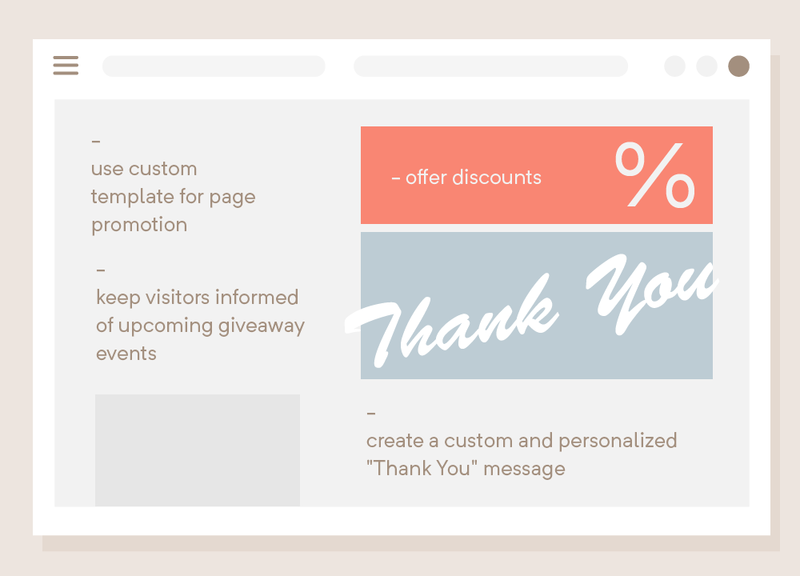 Creating a custom “Thank you” message – Once the entrants enter your giveaway, it’s a great idea to display a custom “Thank you” message to each of them. Its biggest advantage is that it’ll reach every single user who lands on your giveaway page while the giveaway is still running, as opposed to the congratulations message which will appear in front of the lucky few once the giveaway has ended. Your “Thank you” message can be customized in a similar fashion as the congratulations message and can include everything you’d like to share with the entrants. Posting giveaways on Facebook is a great way of interacting with your customer base. Not only will it help you improve user responsiveness, but it’s also a great way of generating leads. A well-thought-out giveaway will drive page views through the roof and it’s up to you to decide how to capitalize on the added traffic. Feature the content submitted by the winner – If you are holding a contest in which the winners will be selected by the content they produce, such as a photo or video submissions, make sure to post the content along with the winners’ name. Include a link to the giveaway – Including a link to the contest will boost brand reach since even non-contestants will notice it. Potential leads will follow your page for the prospect of future giveaways. If you your business runs giveaways frequently, make sure to let everybody know about it. Describe the prize – Boost your followers’ excitement by describing the prize when announcing the winner. If you plan on featuring the same prize in the next giveaway, don’t forget to include that information as well. Describe how the winner was chosen – Let your customer base know what your winner selection process was – was it a randomly generated user or you had a panel of judges who decided on the winner? Be transparent and you will build trust. Tag the winner and thank everyone for entering – Thank everyone for entering the contest, especially if the winner was chosen based on the number of user likes. Also, be sure to tag the winner and have all of his friends and followers who share the same interests take notice of your brand. Include a link whenever possible – You are limited to 280 characters, but there are no limitations when it comes to linking. Include a link to the giveaway or your website if you have a page dedicated to the winners. Mention the winner – The winner is likely to have a Twitter account, so make sure to mention them in your tweet to engage them in a conversation. Post an image – If you have any user-generated content, be sure to publish it with the announcement. If not, create an image that will make your post stand out, thus promoting your business and growing the follower base. Instagram offers a plethora of promotional options for marketers, with Instagram stories being one of the most effective tools to increase customer engagement and boost reach. This social network is customer-focused and efficiently reaches your target audience. Considering, it’s a fantastic platform to organize giveaways and announce the winners. What better way than to broadcast it live? Using Instagram live stories to announce the winner is fun and exciting, and it’s gaining in popularity as we speak. The story streams live, but it stays online for followers to watch later and repost it as a part of their own story. What is more, live stories reassure your brand followers that your giveaway is fair and transparent, thus building trust as well. Marketers of yesteryear knew what they were doing when they organized live TV broadcasts announcing sweepstakes and contest winners. Another great way to build excitement and suspense is by linking Facebook and Instagram stories to announce the winner. In this case, it’s much more effective to use images instead of videos because they don’t rely on sound and can be easily skimmed. Some decide to create several slides which tell one story. For instance, the first post could just focus on the prize and include the date when you’ll be announcing the winner. The next one can be a sneak peek, such as the first letter of the winner’s first name, and the final photograph can be a happy winner holding the prize. The idea behind this is to publish conversation starters and build suspense. Announcing the winner’s name with a @mention is a great option if you have multiple winners. Be sure to use this to the fullest by publishing an individual story for each one of them and, ideally, include a fun description of the prize. This will definitely boost customer engagement and help you gain new followers. This has got to be the most popular way of announcing contest winners on Instagram. 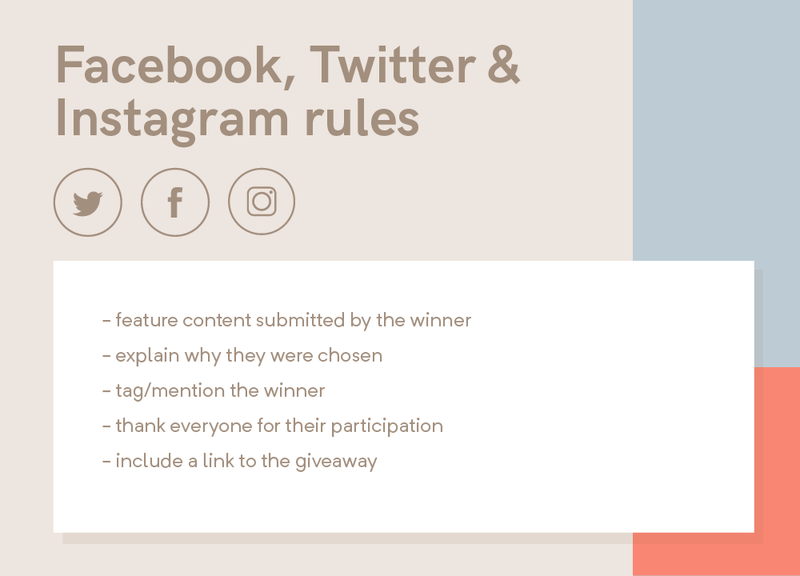 Typically, you would publish a story or post with the winner’s name as a @mention and encourage them to send you a private message for further details. A good rule of thumb is to publish the same or similar image from the initial promotion. That way, it’s easy to grab your followers’ attention. Alternatively, you can reach out to the winners by direct messaging them from your brands’ Instagram profile. Your giveaway was a blast and your congratulation message proved successful in driving followers to other pages you want to promote, but now that the giveaway is over you’re wondering whether there’s something else for you to do. Actually, there is! Make sure to have quality leads on your list – Giveaways are a great way of generating new leads, but not every lead should be added to your CRM platform or mailing list. Email marketing services cost money, so it is best to exclude low-quality leads to cut the costs. One way to achieve this is by setting up a confirmation autoresponder email and removing email addresses of all people who fail to send you a confirmation email. You can handpick the addresses yourself, or use a built-in fraud detection tool. Organize your new list – Once your list consists of quality leads only, it’s time to segment it and create a personalized email message that you’ll send to the people on your list when you decide to organize a new giveaway. Include information like location, gender, age, industry, relations to your business, etc. Employ give-to-get concept – Giveaways function in such a way that you first have to offer something in order to get something back, and the more you give to your entrants, the more you’ll get in return. This means that you should be ready to share a relevant offer with your followers once the giveaway ends, so every person who takes part in your giveaway feels like a winner. Try sharing a special offer targeted only at those who entered the giveaway, and they’ll be enticed to participate in your next giveaway as well. Once you complete all the steps mentioned in this article, you can rest assured that your giveaway promotion will truly work to your advantage!